Shown above is one of our recent installs in Los Angeles, CA. 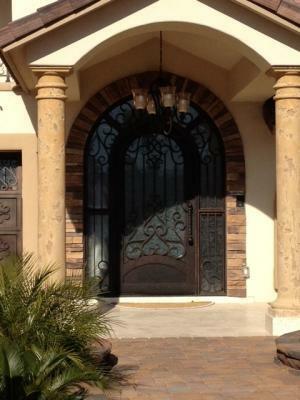 A beautiful home deserves a beautiful iron door as its focal point and thats exactly what we did for our customer above. It sets the tone for the entire house, and establishes a feeling of warmth, style, and elegance. This important first impression should be an iron door of only the highest quality. At Signature Iron Doors we offer an extensive selection of iron doors, sidelights, transoms, iron railing and iron garage doors. We can take care of any of your iron needs with quality products and fantastic customer service. We invite you to take a look at our website and contact us to talk to one of our representatives to see how Signature Iron Doors can create the masterpiece of a home that you have always dreamed of.